This post is sponsored by Golden Girl Granola, but the opinion expressed is all mine! I was excited to review Golden Girl Granola and honored too. Golden Girl Granola came to life after hard work. 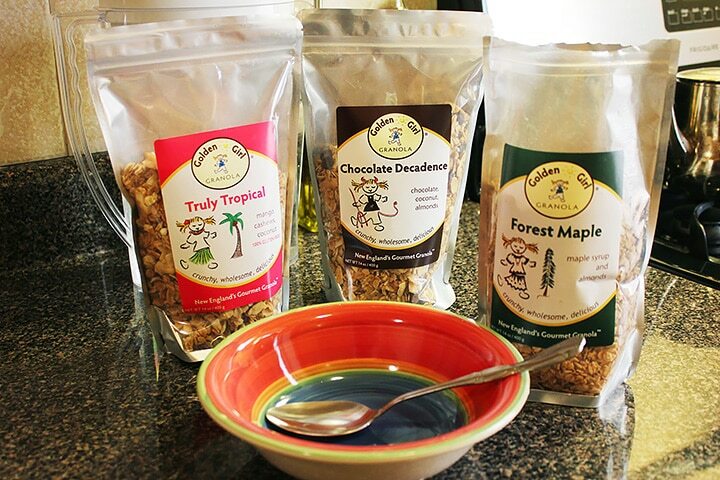 If you want to know more about the beginning of Golden Girl Granola please visit their website. 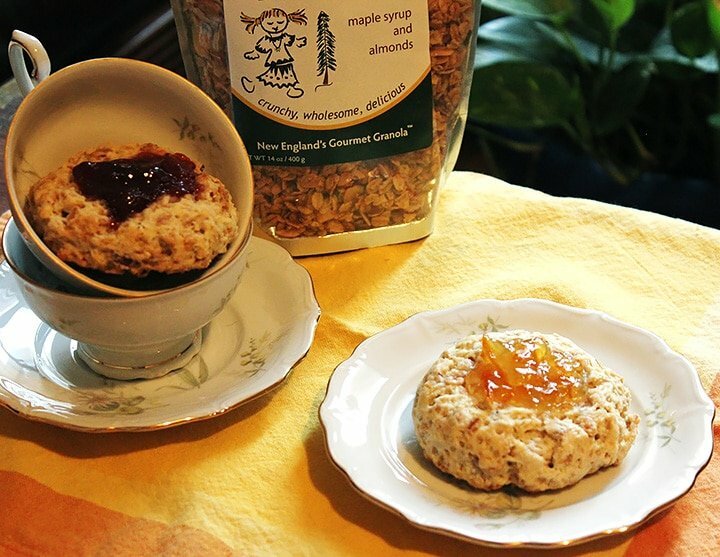 Golden Girl Granola comes in seven delicious flavors that include blueberry, Chocolate Decadence, Creative Cranberry, Forest Maple, Home Sweet Honey, Original and Truly Tropical. It is all-natural, whole-grain granola that is non-GMO, dairy free, cholesterol free, casein free, trans-fat free, wheat free and has no preservatives, artificial color or flavors. I like Granola and I keep making different versions of it but boy I was pleasantly surprised when I tasted Golden Girl Granola. I started with Forest Maple Syrup, It’s delicious and I’m glad I grabbed it first thing in the morning. I had it with milk and that was it, great tasting, easy, and healthy breakfast. But do you think I’d stop there? Never. 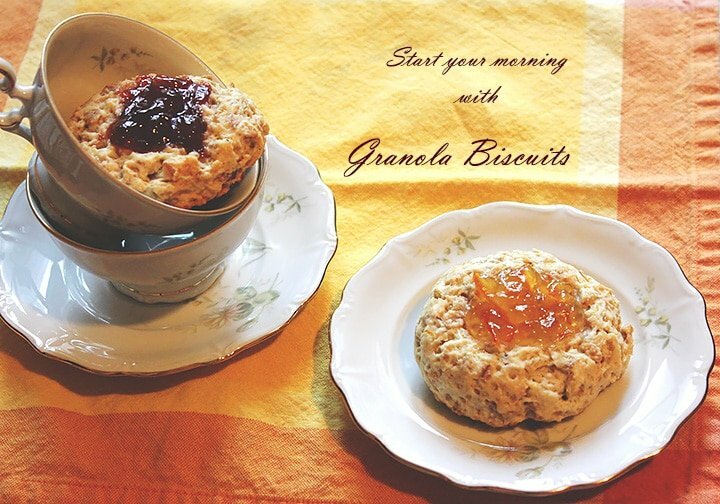 The taste of Golden Girl Granola inspired me to create Granola Biscuits which I’m sharing with you today. These biscuits with a glass of milk is a complete breakfast, filling, delicious, and will leave you asking for more. In fact I’m sure that when you taste it you’d be curious to try other flavors from Golden Girl. My son and nephew love biscuits, so it’s a smart way to include some healthy granola in these biscuits. My husband loved the granola with coconuts, he actually took it with him to work and is having great time snacking on it. 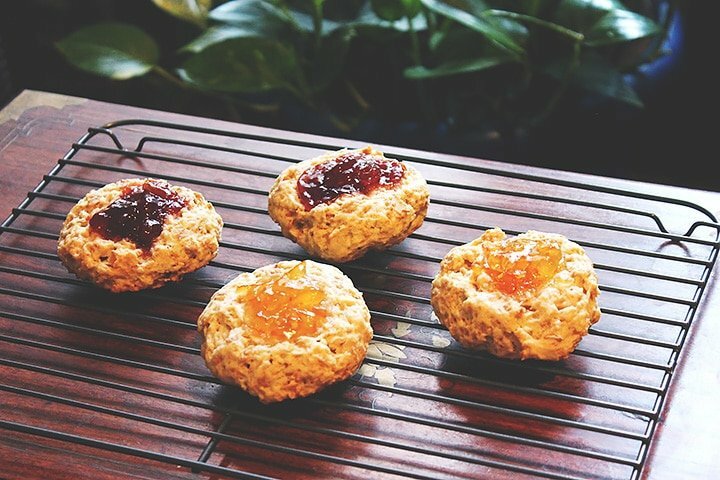 The best thing about these biscuits beside the flavorful taste is that preparing them hardly takes time. These Granola Biscuits taste even better the next day. One winner will have the chance to choose 4 flavors from Golden Girl Granola. To enter this giveaway all you have to do is like and follow Golden Girl Granola on Facebook and Twitter and let me know in the comment box below. Giveaway ends on May 11, 2015 and is for US residents only. Now let’s bake some yummy biscuits! Preheat oven to 190F/375C. Line baking sheet/pan with aluminum foil or parchment paper. In a bowl, whisk flour, sugar, granola, baking powder, baking soda, salt, and lemon zest. Add the butter. Using your fingertips, mix the butter with flour mixture until you get a wet sand texture or coarse crumbs. Add the milk gradually and mix gently with a spatula or wooden spoon until dough comes together. You may not need to use all of the milk. 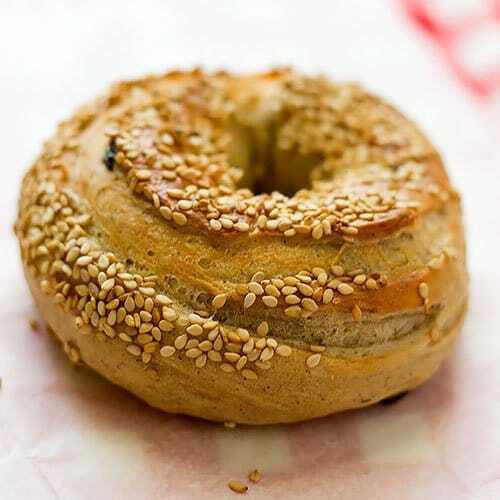 Knead the dough for 8 seconds. Form 4 equal size balls from the dough. Place the balls on your baking sheet/pan. Press the balls with your fingers gently. The height of the balls should be around 1” to 1.5”. Press the center of each ball with your thump and add your favorite flavor of jam or preserve. You can skip this part and make plain biscuits, they will still taste amazing. Lightly brush with milk and bake for 20 minutes. Granola with cranberries.. yummy! And these cookies look really perfect for teatime! I would love one for my tea now 🙂 They look great! I liked on Facebook and followed on Twitter! Those look delicious! I like Golden Girl Granola on Facebook and follow them on Twitter. 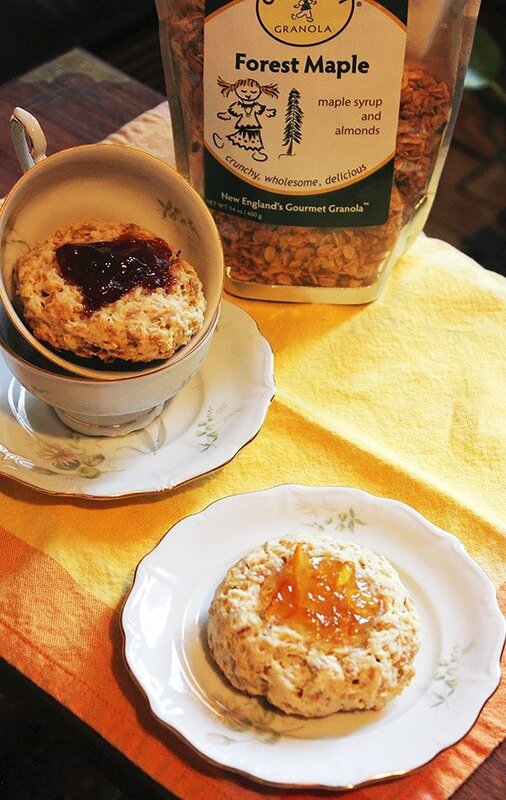 Your granola biscuits look awesome, great way to fuel up for a busy day! I liked on FB and follow on Twitter.